Sir Arthur C. Clarke is among the most revered science fiction writers the genre has ever known -- responsible for some of the most iconic stories and essential technology of the modern world. 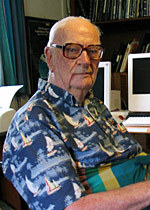 Some sci-fi storytellers are content to merely predict, but Sir Arthur C. Clarke creates. The writer is single-handedly responsible for the cornerstone of modern telecommunication: the satellite. Clarke details the design of satellite technology in a 1945 essay. His failure to patent the radical idea results in an aptly-titled later essay: How I Lost a Billion Dollars in My Spare Time. In the 1960's, Sir Arthur collaborates with legendary filmmaker Stanley Kubrick on the breakthrough epic 2001. The film revolutionizes sci-fi cinema and correctly prophesizes details of our modern world, including commercial spaceflight, video-chatting, and even iPads. But can the deadly artificial intelligence of 2001's HAL 9000 be far behind? Clarke's 1979 novel The Fountains of Paradise proposes an ingenious method of traveling from Earth to the stars: a Space Elevator. Today, Clarke's prophecy of geostationary, non-rocket spacelaunch is being realized as hi-tech building materials make fully functional space elevators a very real possibility for the near-future. Sir Arthur C. Clarke's writing ushered in the dawn of the space age and gives us a glimpse of the next stage of interstellar travel. His sci-fi legacy inspires us to unveil the mysteries of the universe, confident in the knowledge that science is the new magic. To purchase the Science Channel's excellent one-hour documentary on Clarke, click here.